eBay gives you access to millions of buyers worldwide, and the support your business needs to grow and thrive. If you haven’t already, register for a new account. Enter your personal and contact information and follow the instructions. PayPal is the best way to get paid on eBay. Set up a PayPal account and link it with your eBay account to easily accept payments for items. List your item—tell us what you’re selling in the Sell Your Item form and select Get started to begin listing your item. eBay buyers around the world prefer to pay with PayPal, and you get paid faster when you accept it. It's fully integrated into eBay, comes with handy tools for tracking and shipping your goods, and lets you accept payment seamlessly in any currency, without having to worry about conversion or exchange rates. You can set up a PayPal account for free, then link it to your eBay account to start accepting buyer payments in minutes. You can learn more about getting paid on eBay in our Fees & Payments section. When you list on eBay, you have a choice between two listing formats: auction style, and fixed price. 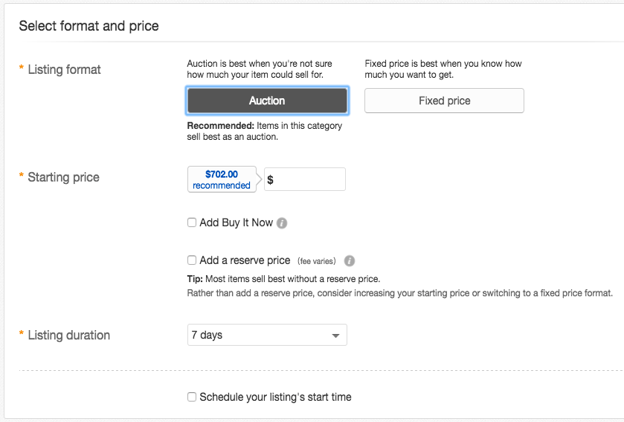 Auction style listings let you set a starting price for your item—typically the lowest price you're willing to accept. Interested buyers then place bids on your item, driving the price higher until the listing ends. The highest bidder then wins the item. Fixed price listings allow you to list your item at a set price, so that buyers can purchase right away without bidding. While the format you choose is up to you, we generally recommend that business sellers choose to list in the fixed price format, unless the value of the item is unclear, as can be the case with liquidation items or damaged inventory. Other listing formats, such as Classified Ads, eBay Motors, and Real Estate, are available on select global eBay sites. You can learn more about choosing a selling format on our help page. You can learn more about promoting your item with listing upgrades on our help page. If your item is of higher value, you might also consider adding a reserve price. For an additional fee, you can build a hidden minimum price into your listing—essentially, the lowest price you’re willing to accept for your item. If the listing ends without enough bids to meet the reserve price, you aren’t required to sell the item. You can learn more about reserve prices on our help page. Pricing your item right not only makes it more likely to sell and bring you the best value in return, but it also helps your item appear higher up in search. While buyers can search for items in a variety of ways, the default search method is Best Match. Best Match takes into account the listing price as well as the shipping fee. Setting fair pricing for your item and for shipping will get your items seen more often and by more people. If you’re not sure how to price your item, you can search for items similar to yours in Advanced Search, filtering for Sold Listings. You’ll be able to see what other items have sold successfully for in the past. You can also search live listings for items like yours to ensure that your pricing remains competitive. We calculate Price Guidance based on recent sales of similar items on eBay. It takes the item condition and item specifics you've entered into account when calculating the recommended price. Keep in mind, the Price Guidance recommendation is for the price of your item only, and doesn't include suggested shipping or handling costs. Price Guidance is just a suggestion—you don't have to use it. As a new seller, you may have limits placed on your account until you confirm certain information, or establish a positive selling history. These limits help you become a more successful seller, in addition to ensuring a safer experience for all eBay members. With a positive selling history, you’re able to request higher selling limits. You can learn more about selling limits on our help page.